The ™ is a class AB amplifier just like 90% of all guitar amps past and present. "Oh" you might say "surely it can't be as cool as one those class A amps we’re told sound so good and love to pay so much for!" Well lets just take a look at this class business and…(prepare to be disappointed!). Marketers have had a field day in recent years with the term class A, with all sorts of claims regarding the fabulous class A sound, and this or that expensive amp being class A. It’s getting to the point where if it isn't marketed as a class A amp its seen as somehow inferior! All this despite the fact that just about every great guitar sound on all those classic recordings were done on amps that operated in class AB! What is the sound of class A anyway? The truth is most of us would be hard pressed to tell what the operating class of an amp is just from listening to it, and class AB amps can be made to sound like a class A amp without too much trouble. The truth is most of our favourite amps from the last 40 years have almost all been class AB amps e.g. Marshall, Fender, Vox.. yes them too!! Firstly let’s look at the definitions of what is class A and class AB. The operating class of the device, in this case a valve (tube if you are in the US), describes how the device is biased and how much of a complete cycle of the applied signal it passes. 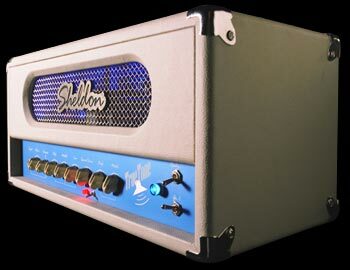 In this case we are only talking about the amps output section; that is the power valves EL34, 6L6, 6V6etc. For a class A output stage all the valves remain conducting and contributing to the output signal during the complete signal cycle. This also means that power consumption is constant and consequently high. Transformers in these output stages have to be meaty to cope and this means more expense. Class A amps are at the very most 50% efficient so to get say, 25W of output they have to have valves capable of dissipating at least 50W of power. It's not altogether good news for those of us who like a lot of 'Sag' in our amps but more on that later. Class A amps can be Single Ended, these generally have only one output valve and include amps like Fender champs etc, or can be Push - Pull like say Marshall's etc. Class A is prized in HI-Fi amps for its clear, low distortion sound and in guitar amps can sound very nice for clean playing with good definition and sparkle. For a class B output section, which must by their nature be a push - pull arrangement, each half of the output section only conducts for half of the output signal cycle,- when one side is off the other is on. This means that the valves have an easier time of it since each side only does half the work. Class B amps are more efficient and are usually about 70-75% efficient thus can generally produce more power than class A amps. There are trade offs, class A has less distortion, though for guitar that’s not always what you want is it? However the distortion in class B can be harsh, and because the push - pull arrangement tends to have mostly odd order harmonics which, while these can give some bite and grit to the sound, can be pretty grating on the ears if overdone. So what’s the optimum for guitar? You've all read it in many a review and other places… "The Vox AC 30 typifies the great sound of class A"… or does it? Firstly it's a 30W cathode biased amp. What does that mean?… well a cathode biased amp uses a resistor in the cathode of the output valves to set the bias, and the bias defines what operating class it will run in. Connected across this resistor is generally a cathode bypass capacitor and this is designed to increase output power and give a little more grind to the output tone. Cathode bias while often associated with class A does not mean that the amp must be, or even is, running in class A. Though the majority of class A amps in the past have been cathode biased. The addition of the cathode bypass capacitor throws something of a spanner in the class A works for reasons we will see. The trouble is four EL84's can't pass much more than 150mA at this voltage into the 4K load without exceeding their maximum dissipation rating and suffering premature expiry! So what's going on? is our maths wrong or what? Well actually no it's not. Remember we said the AC30 has that cathode bypass capacitor? Well, once the maximum total idle current is reached by the driven side of the push - pull arrangement, the 'extra' current is pulled through the bypass capacitor, at this point the other half of the push - pull circuit stops conducting and……………WHOA… wait a minute, isn't that class B operation????? Well err.. yes! actually it is, and here we are with the amp that typifies the sound of class A. funny old game isn't it? In actual fact the AC30 operates in class A up to around 22W or so then there is a transition into the class B zone so guess what…that makes it class AB oops! This is why AC30's sound so nice and clear and chimey at low volume and get nice and 'gnarly' when flat out, so class AB don't sound so bad after all!! Let’s hear no more of this class snobbery. There is nothing wrong with class A or class AB , they both can sound great, and we said so! The truth is that real good tone is dependent on much more than the operating class of the output section. What about that lovely compression that valve amps are so famous for? Most guitarists love the way some valve amps will smooth out when really pushed hard. What gives them the ability to do that? Well, apart from the fact that valves have a very smooth transition into distortion compared to solid state devices, which can get very harsh very quickly! The compression effect is in part down to a thing called ' Sag' in the power supply. Sag is particularly present in amps that use a valve rectifier, this is because the valve rectifier has a higher 'impedance ' than solid state rectifiers, so the more current pulled through the valve rectifier the more voltage is dropped across it. Solid state rectifiers use diodes, which have no real impedance, so drop only a very small voltage and this is independent of any current pulled through them. Also some amp's use a 'choke' in their power supply, this looks like a small transformer, but performs a different job to the mains and output transformers, it actually helps to smooth out any power supply 'ripple'. The choke will give a clearer stronger tone, the resistor will give more compression and distortion. Usually resistors are used in lower power amps or for reasons of cost since a resistor is far cheaper than a wound component like a choke. Compression also happens more in cathode biased amps but for somewhat different reasons, combine all these reasons and we have sag city!! That's why everybody likes old amps like early tweed Fenders. So what's the 'bag' with 'Sag'.....? Sag occurs in the power supply when a lot of current is pulled through the output section, like say when you're playing loud and hard, this causes a voltage drop across the impedance's within the power supply and this voltage drop causes a drop in output power. This will happen even more if the mains transformer is under- rated and can only just keep up with demands on it. When the current demand reduces, the voltage is restored and the output power is increased. This action 'stretches' out the attack of the note or chord played giving a smoother sound, this is what we call 'compression'. The slight problem with this is that it tends to lead to a rather loose bass response and the amp doesn't always 'track' as fast as you'd like, makes those snappy clean chords a bit muddy, but giving a nice liquid 'singing' lead tone. In the case of a cathode-biased amp, the bias voltage is generated across the cathode resistor, this effectively reduces the voltage appearing across the valve, making it appear as though the valve were operating at a lower voltage than the power supply would indicate. This tends to give a smoother 'browner' tone to cathode biased amps. Any excess extra current draw also causes a slight rise in the effective bias voltage, since not all the extra current will pass through the bypass capacitor, this slight extra bias voltage tends to turn the amps power down a bit. Then when the current reduces, the bias voltage returns to normal and the power picks up again giving the same compression effect. This gives a more 'singing' tone to the output. If we recall from before, in class A output sections we are running pretty much flat out all the time, so this sag effect happens much less since the power supply is kind of pre-sagged! So to speak, and the compression effect mostly comes from the cathode bias, if that’s what the amp uses. (Not all class A amps are cathode biased but the majority have generally been). The ™ isn't cathode biased nor does it have a valve rectifier. Also, our mains transformers are very well specified and easily able to cope with excess current demands, this does tend to reduce any tendency to sag but does give a tighter, faster response with better bottom end and a good ability to track notes effectively. In fact, the circuitry has extra diodes in the pre-amps power supply section to specifically prevent the pre-amp from suffering any excessive power supply sag. Sag lovers need not despair however because the ™ incorporates just a little bit of cathode bias combined with fixed bias to sweeten things up a bit when the amp is really pushed hard. It also has a resistor in place of a choke to get a little bit more compression and a sweeter distortion when playing at high levels. See.. you can have your cake and eat it!! How many valves does it take to screw in a light bulb…? The truth is that the output power depends upon much more than the number of valves used. More valves doesn't always mean more power, just a different tone! Output power is dependent upon a lot of other factors, such as the power supply used and the output transformer specs. The whole power supply and the output circuit design influences the output power and must be designed accordingly. The reason we have given the ™ the ability to use two or four valves in the output stage is so you can decide what tone you want! Lets look at what difference using two or four of a particular output valve makes to your tone. Two of the most popular amps used by guitarists are 50W and 100W Marshall's. Some folk's love the sound of the 50W others just gotta have 100W! Despite what they might think the differences ain't all to do with volume! Believe it or not there isn't that much difference in the actual volume between the two, but there is a different tone there. The 50W gives a smoother response at lower SPL's, (sound pressure levels -that’s volume to you and us!) than the 100W. This is because the 50W output moves into the class B (there's that class thing again!) zone earlier giving more odd harmonics and beginning that power amp distortion we like so much. The 100W on the other hand is able to stay in the class A region longer and thus remain cleaner higher up the volume stakes. 'Clean' volume tends to sound louder than 'distorted' volume, this gives the 100W more articulation and definition at higher volumes, which you prefer is down to personal preference. The ™ gives you the ability to choose the 50W or the 100W tone but have either at more sensible volume levels than a 100W amp will put out. The truth is most people don't need 100W of power, most modern amps need loads of power because the design of modern cabinets has tended to focus on reduced size. This somewhat 'strangles' the tone and volume they are capable of putting out. You'd be shocked at just how loud 20W can be through a properly designed cabinet. Think on this: a full classical orchestra puts out about 60-70W of power! And they don't have much trouble being heard!!! Small cabs sound small, for a big tone you need a big properly designed cabinet, let the tone have room to breathe, your amp will thank you for it!